Batter bread is easy to make and I make it more often then the other bread recipes because it is softer and my family enjoys it more. This recipe requires bulgur wheat for the cracked wheat. You can either use whole kernels or coarse cut. If you have an heavy duty mixer it is easy to mix. Mix ¼ cup bulgur wheat with ½ cup water in a microwavable bowl. Heat until boiling. Set aside and let cool until about room temperature. ( don’t want to kill yeast it too hot) When bulgur is ready. Pour warm water in large mixer bowl and add yeast. Let sit for about 5 minutes until it is bubbly. Add sugar, bulgur wheat with its water and butter. Mix until blended. Add salt and 1 cup flour. Mix until blended change to batter hook or mix by hand if batter gets to thick for your mixer. Slowly add the rest of the flour and beat until smooth. Cover and let rise in a warm place until double about 45 minutes to a hour. Stir down batter. Place in a greased 9 inch by 5 inch loaf pan that has been greased with shortening or sprayed with vegetable oil spray. Cover with greased or sprayed plastic wrap for about 30 minutes. Let it rise just slightly above the edge of the pan or it will over flow the edge and sink in the center when baking. Keep an eye on it because some times it will rise very fast the second time. Preheat oven 375 degrees F. about 15 minutes later so it will ready to bake when dough reaches top of the sides. Bake for 30 minutes and brush top with butter. Return to oven for another 10 minutes until done. This is a little too high. 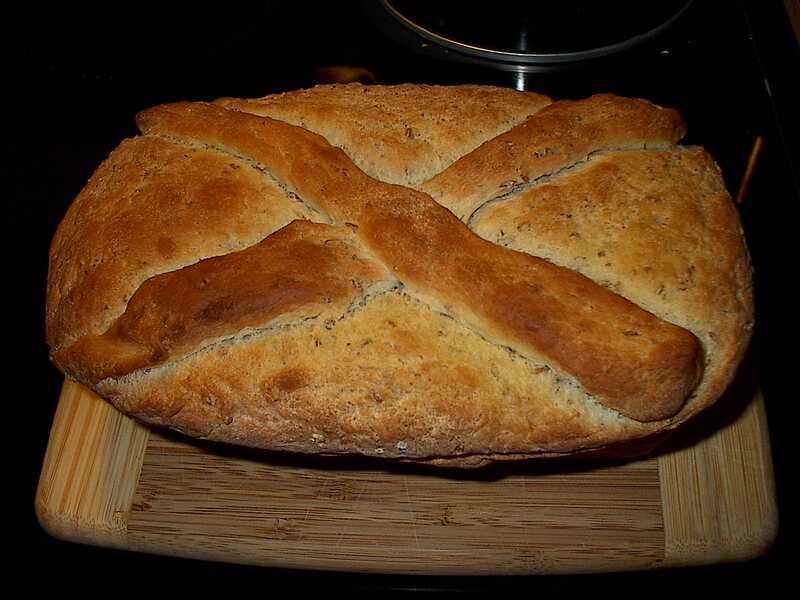 I made the x design by rolling two thin ropes and place them on top when putting batter in pan to rise the second time. Lovely! I only use yeast batters for things like crumpets and sweet cakes; I should try savory breads. You can just about put any thing in batter bread. I like it with cheese too. Thanks for stopping in. Yum…….I bet your kitchen smells divine! That is beautiful bread. Yes bread baking always makes the house smell good. It is nice to have you stop in. I’m not at all familiar with batter breads but if they look this good, I need to change that. Thanks for sharing. Now I need to find bulgar wheat. Most commerical breads are batter breads that is why they are so soft. I usually find bulgar in the baking section is most grocery stores. You can also find it in bulk sometimes in a natural food store. Happy Columbus Day. Hey, I *love* the ropes on top. Beautiful! Now that I have read about it, I still don’t understand much. “Bulgur is a common ingredient in Armenian, Syriac, Turkish, Middle Eastern, and Mediterranean dishes.” I guess I can make my Syriac cuisine more authentic with this? Trkingmomoe, good going with this blog! Me like! Thanks for taking a close look. I post on dag but I write it here first so I have a url for the pictures. I started this the last weekent of May so I am still learning. DD talked me into this. I have lots that I want to do with this. I am also amazed at how well it is received. Eastern Europeans also use Bulgur wheat in their cooking. Please stop back in anytime. You inspire me to try to bake bread again. I find lots of neat recipes to try. My cook books have index cards marking the pages of recipes I hope to make. The hard part is picking one to do next. This is the time of the year that I do a lot of baking until after Christmas. Thanks for stopping by. Your Facaccia looked really good and had me looking up recipes to try it too. Thanks for you comment. Looks like a good loaf of bread…I will be eating similar breads while traveling in Germany and Austria. I saw your last post and the yummy meal you had. Can’t wait for more pictures of your trip. You make the BEST breads! I am enjoying your fall pictures that you have posted. Thanks for the complements. Oh! I love making bread. Wheat especially. I like the little criss-cross on top- makes it look extra fancy! I stopped to drop you a quick line to let you know I’ve moved the hosting for Sugar Dish Me so it won’t appear in your wp.com reader anymore. I’d love it if you’d re-subscribe via email or rss feed; the address is still the same http://www.sugardishme.com/ . Thanks so much for taking the time to read and interact– I really appreciate it. I did that today. So you will be hearing from time to time. Thanks for stopping in. Most batter breads are softer then the artisan kneaded breads. Give it a try. Just make it with out bulgur if you can’t find it. It is still good. Thanks for stopping by. This looks delicious and I love the x design. It is funny, the moment I saw the cracked wheat batter bread I instantly thought about peanut butter and jelly sandwiches with it. That sounds so good right now! Now that looks like something I might not be able to mess up to badly. You are quite the artist in the kitchen. I had to revisit this piece because I’m a darn CARB LOVER! lol! 😛 Awesome visual presentation! Thanks. It is actually my own recipe. I like to make batter breads because they are faster and easier then bread machines. I go to the Goodwill to find interesting dishes to use in photos. Cheap under a dollar dish. My box of miss matched dishes is growing. Staging food for pictures is not as easy as it looks. I take lots of pics until I get one that looks nice. I appreciate your comment. This is a batter bread so you would have to use a cupcake pan or other small round tins to shape them into buns. The batter is too soft and sticky to shape into buns to be baked on a tray. It is not a traditional bread that you knead by hand and shape. It is an easy recipe to make. If you have a heavy duty stand mixer let it do the work for you using the dough hooks. I live at sea level in the tropics so I don’t do a second rise with it. So keep that in mind and give a second try if the recipe doesn’t rise nice. 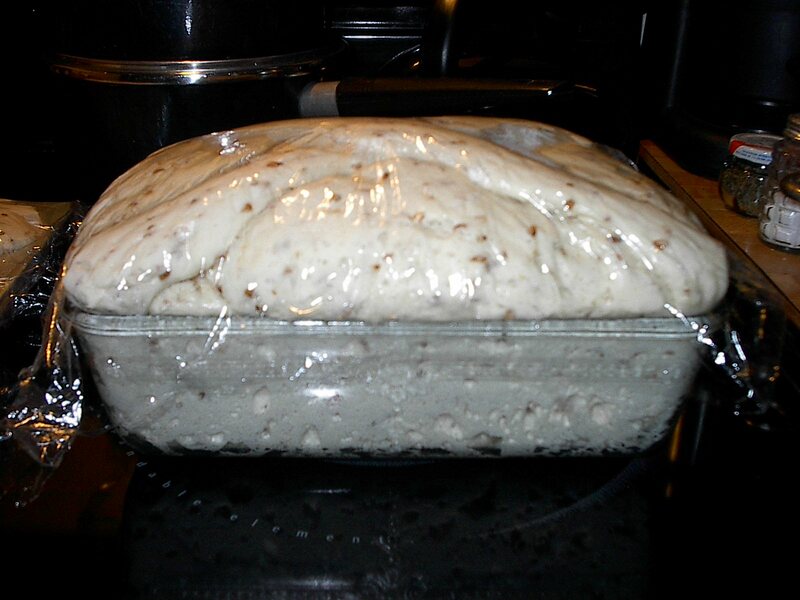 The next time rise it in a bowl and punch down, then rise a second time in the bread pan. Just keep an eye on it and you will figure out what works for you. Thanks for the advice! I attempted to make bread once and it came out really dense. I would love to make my own and not have to buy any. Batter bread is a much lighter bread. In fact the bread we buy at the grocery is batter bread. Give it a try. Let me know if you have any trouble or questions. I was looking for your recipe for the bread and I can not seem to find it. Is it under bread on your blog? Because it is on the home page feature board, it doesn’t show up on the recipe list. This is a quark with the theme. When I change the rotation on the Feature header on the home page and put new items on the rotation then it will be back on the menu under baking and bread. Just go to the home page and click on the arrow until you get to it.